This is one of three sketch designs for the brass memorial plate to John Mitchell, lay clerk, by A.Y. Nutt, Chapter Surveyor from 1873-1912, who designed six monuments for the chapel. This one can be found on the wall of the north quire aisle and reflects the 19th century trend for biblical quotations. John Mitchell was born at Eton on 4th July 1809. He entered the choir of St George’s Chapel as a chorister on 22 May 1815, before he had even reached the age of six. He died on 13 January 1892, still a member of the choir of St George’s, having been associated almost continuously for over 75 years. John Mitchell acted as chorister until January 1826, during his time singing at the burial of George III and the Coronation of George IV. Four years later, on 9 August 1830, the Dean and Canons of Windsor ordered that he should “officiate as organist and instruct the singing boys until a new organist be appointed.” He had only just turned 21, and from that moment on, he maintained an unbroken association with the College. He was appointed as a lay clerk in January 1832 on the death of Stephen Heather. Heather had been organist at Eton College, and John Mitchell took on this responsibility as well. At the time, Eton did not have its own choir, with services being sung by the choir of St George’s. With emphasis placed on St George’s, services at Eton were described as “slovenly. The boys did pretty well but the men seemed to think that they were not bound to take so much pains as at Windsor…”. It would seem that John Mitchell was unable to exert the same authority over his fellow lay clerks when singing at Eton as George Elvey, Organist of St George’s, could when at Windsor. In addition, this arrangement meant that little time was left for educating the boys as so much was taken up by choir practice. As a result, the chorister school of St George’s came under fire for its poor educational performance and in 1867 the two separated. Eton established its own choir and school and it was at this time that John Mitchell retired from the office of organist there, on full pay. 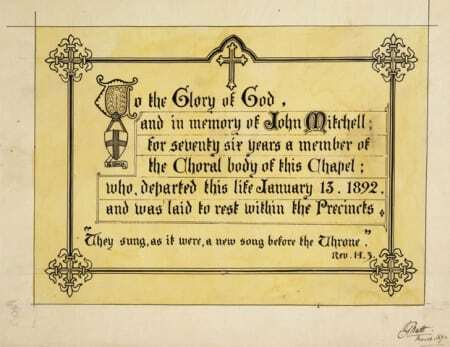 John Mitchell continued to serve as lay clerk for another 25 years, before finally passing away on 13th January 1892. As lay clerk, Mitchell sang at the Coronations of William IV and Queen Victoria, and he also sang at the Jubilee Service in Westminster Abbey, June 21, 1887. After the latter event Her Majesty the Queen presented him with an engraved portrait of herself as recognition of his long musical services. 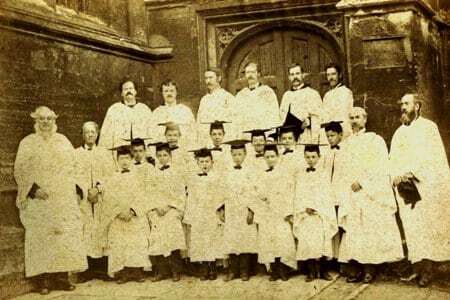 This photograph was taken around the same time and shows Mitchell on the far left with the other members of the choir outside the north door of the Chapel. During his time at St George’s Emily, Annie Eliza, John William, and Mary were born to John and his wife Mary, all of them baptised in the Chapel. Sadly Annie Eliza did not live long, and she was buried in the chapel on 17 March 1842, aged just 3 months. Mitchell was to suffer further loss when his wife Mary passed away not many years later. His sister Ann came to live with them in the Horseshoe Cloister in order to help raise his young family. John himself was buried in the Chapel on the 16th January 1892, and this monument erected shortly afterwards.